Summer is approaching, which means it’s time for shorts, bathing suits, and showing some skin! However, many women may feel self-conscious during this time due to the appearance of cellulite on their thighs and buttocks. This is a common concern for women, which is the reasoning behind the creation of Cellfina. This treatment helps to remove the look of cellulite on the body quickly and easily*. At Skin Perfect Medical Aesthetics, we are proud to offer this innovative cellulite reduction treatment. To learn more, please contact our office and schedule your consultation with one of our skin care specialists today. Before learning about the Cellfina treatment, it is important that patients understand what cellulite is and how it affects the body. 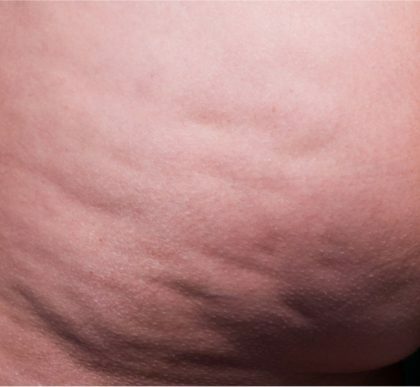 Cellulite, clinically known as adiposis edematosa, is a condition in which the skin has a lumpy, dimpled appearance due to fat deposits pushing through the connective tissues that are just beneath the skin. This condition develops mainly on the thighs and buttocks and can be a source of embarrassment for women and men, although women are most commonly affected. The puckering of the skin, as seen with cellulite, is caused by tension in the connective tissues. 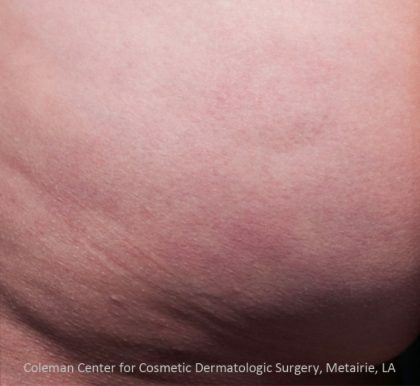 Because the connective bands do not expand or stretch, the fat will begin to protrude through the tissues and cause a lumping appearance of the skin. The majority of women experience cellulite in at least one part of their body and, unfortunately, this condition is one of the most challenging to reduce through diet and exercise alone. There are many causes for cellulite, such as lack of physical activity, slow metabolism, and genetics. Age is also a significant cause for this condition because, through the natural aging process, the body’s production of collagen and elastin will decrease. This can lead to weakened connective tissues and make the skin more prone to being pulled by subcutaneous fat. It is important to remain active and avoid eating too many carbohydrates and sugars to help prevent the appearance of cellulite. Everyone’s body is different and will be affected by cellulite to various degrees. There are different levels of cellulite that a patient may have. These cellulite levels are listed in detail below. Level 1 on the cellulite scale indicates that there is no visible dimpling to the skin. However, at a microscopic level, patients will be able to see that the connective tissues are experiencing slight tension and undergoing structural changes. This will be noticeable when pinching the skin together, revealing mild dimpling. In Level 2, there will be visible bumps in the skin when standing. This is because the skin’s elasticity has decreased and there is growing tension in the connective tissues. At a microscopic level, there will be even further anatomical changes. Ripples and bumps in the skin are visible when standing, as well as when sitting. The skin begins to have noticeable changes to its texture, resembling the look of an orange peel, as well as experiencing the signs from the other levels, one and two. Women are more commonly affected by cellulite, although it can be seen in men in some instances. This is because men have a fibrous tissue pattern that is crisscrossed, like a hashtag “#,” and goes horizontally along the muscle. Through this tissue structure, there is little to no pulling down of the skin. In comparison, women have a fibrous tissue pattern that is only vertical. This makes the female body more susceptible to developing dimples on the thighs and buttocks. Additionally, women have a higher fat percentage than men, and their bodies tend to store more fat in the hips, legs, and buttocks. Cellfina is a minimally invasive cosmetic treatment that reduces the look of cellulite on the thighs and buttocks*. 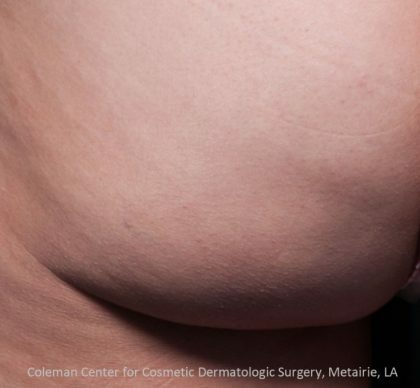 Cleared by the FDA, Cellfina has become the leading cellulite reduction treatment on the market. The procedure is quick, efficient, and completely safe while also providing long-lasting results*. The Cellfina device uses a pocket-sized applicator to target a specific area and cuts the connective tissues that are responsible for the appearance of cellulite. When these are cut, it stops the connective tissues from pulling on the skin and allows for a smoother, more youthful skin surface*. This one of a kind treatment can provide results like never before*. The highly advanced technology uses a well-established approach called “subcision” to correct structural issues in the connective tissues*. This minimally invasive procedure is safe and effective to provide precise treatment*. Become one of the many patients who has received amazing results through our Cellfina treatment, call us today*! The Cellfina® System is intended for long-term improvement in the appearance of cellulite in the buttocks and thigh areas of adult females. Safety and effectiveness in other anatomical areas have not been established. The most common side effects reported were soreness, tenderness, and bruising. The Cellfina® System is only available through a licensed physician. These two regions are the most frequently affected areas of the body by cellulite and can lead to self-consciousness. Cellfina treatments break the fibrous bands that pull the skin down to provide a smooth, appealing skin surface to both the thighs and buttocks*. To learn more about Cellfina, schedule a consultation with one of our certified physicians today. Because Cellfina is a non-surgical procedure that requires no general anesthesia or incisions, almost anyone can be a candidate. This treatment is ideal for both men and women who want to reduce the appearance of cellulite on the thighs and buttocks*. This treatment is suitable for any body shape and size because the cause of cellulite is not only related to weight. A common misconception is that thinner women don’t get cellulite. However, this is untrue. Genetics play a huge role in cellulite. Therefore women of any size may be affected. Candidates for this treatment must be in good health and have no underlying conditions that could hinder the effectiveness of the procedure. It is also important that the patient is willing to maintain a healthy lifestyle after the treatment to ensure the longevity of the results. Before beginning the Cellfina procedure, the patient’s cellulite areas will be marked to ensure accurate and precise treatment. The physician will then place the Cellfina applicator on top of the treatment area, which will pull the skin into it using vacuum suction. A multi-hole needle will be guided into the suctioned skin, and a local anesthetic will be injected. The multi-hole needle distributes the anesthetic to the entire area for optimal patient comfort. A microblade will then be used to precisely cut the fibrous bands that are pulling the skin down and causing the appearance of cellulite. The Cellfina device allows the physician to manipulate the skin’s structure in an unparalleled way, causing little damage to any surrounding tissues*. The treatment itself takes 45 minutes to complete with minimal downtime. After the procedure is complete, patients will be able to return to their daily schedules*. Once the Cellfina treatment is complete, patients can leave our office immediately. Although there is no downtime required, the patient may want to spend the remained of their day resting. The evening after the treatment, it is recommended to walk a brief amount to help improve blood flow and speed up healing. During the recovery stage, patients may experience mild swelling and bruising to the treatment area. This is normal and will subside on its own, typically within the first few days*. The results will be visible shortly after the treatment and will continue to improve for at least three years*. If patients experience any discomfort while healing, over the counter medication, such as Tylenol or Advil, can be taken. Studies have shown that Cellfina has an 85% patient satisfaction rate after three months and jumps to 93% after one year*. Once the body has fully healed, the results are very noticeable*. This treatment allows patients to attained smoother thighs and buttocks without ever needing a surgical procedure*. To maintain the results, it is advised that patients keep up with a healthy and active lifestyle, as weight fluctuations can negatively impact the outcome of the treatment*. Cellfina treatments vary in price depending on the size of the treatment area and if additional procedures will be combined with it. During the initial consultation, patients will work with a physician to construct a treatment plan based on their needs. Through this treatment plan, they will obtain a custom quote. To get a personalized Cellfina quote, please contact Skin Perfect Medical Aesthetics today and schedule a consultation. Those who are interested in this one-of-a-kind Cellfina treatment can start by contacting our office to schedule an initial consultation. During which the physician will evaluate the patient’s case, looking at their medical history, routine medications, and any current health conditions to help determine their candidacy. Lastly, the physician will examine the patient’s skin to choose a treatment option that is best for their exact needs. If deemed a good candidate for Cellfina, the patient will be able to construct a personalized treatment plan with the doctor and then be given the opportunity to schedule their procedure, although there is no obligation to do so. Here at Skin Perfect Medical Aesthetics, we are proud to now be offering state-of-the-art Cellfina procedure to our patients. Please click here to start your Cellfina treatments!